PI Gumby’s Trips | Promotional Incentives, Inc.
Having a strong presence and involvement in the Boston Red Sox Children’s Charity Classic, PI Gumby became a devotee of this fan-loved team this spring when PromoLucy’s brother Kevin announced he was satisfying his bucket list by going to one of the World Series games at Fenway. 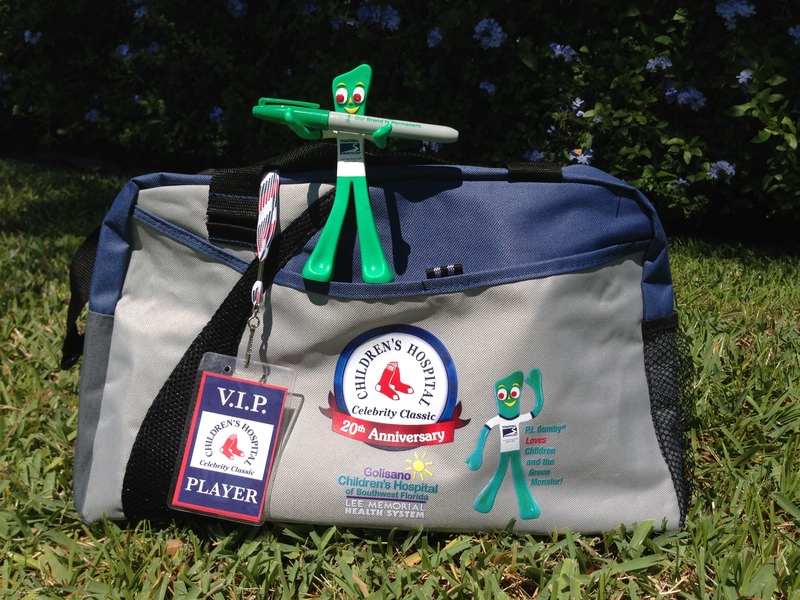 Since the trip was a quick overnight, Kevin traveled with the commemorative event duffle, and the flexible green guy; a perfect culmination of Promotional Incentives’ participation in the 20th anniversary event. After all, PI Gumby met former Bo Sox player Pedro Martinez, and played golf with rookie Ruby DeLarosa. And then PI Gumby had a chance to go to Game 2 in the World Series in Boston. Only one major wrinkle: somehow, there was no PI Gumby in my brother’s house in SC. “Really? !” I asked in disbelief & disappointment, and texted my nieces thinking surely one of them had a Gumby. A series of texts ensued as I tried to enlist my mom, niece or brother to get the lovable green mascot to Kevin’s for an early AM departure. It wasn’t looking good. My brother was embroiled watching Game 1, my niece who can drive was doing homework, and my mom had received sad news about a friend, and didn’t have the energy to go anywhere. After spewing forth emphatic appreciation I called my brother. “It’s all taken care of,” he boasted. “I’ve got Gumby in my pocket.” Not letting him know that I knew mom had been the hero, I gave him the very important task of taking photos of the green guy inside Fenway. Though I wanted to tell my brother he changed the Mojo for the outcome of the game, not much could be done, and I knew he’d be bummed about the loss. After all I’d come up with it in the 9th inning and we just couldn’t pull off the victory before the end of the game. At least he made the trek and maybe made some friends on the plane. Today my brother redeemed himself and sent a photo of Gumby in the arms of the legends in front of the stadium. Let’s hope they pull off a win and become World Series champs again.